United Electronic Industries (UEI) collects real-world data for Aerospace, Energy, and Defense industries so our customers can build smart systems that are reliable, flexible and rugged. All of our chassis (Cube, Rack and MIL) and I/O are ideally suited for military, aerospace, space, simulation and engine test data acquisition (DAQ) and control applications. Ready to tackle environmental extremes (100 g shock, 5 g vibration, −40 to +85 °C), engineered for robustness and flexibility, backed by comprehensive obsolescence protection, UEI COTS solutions are perfect whether you are working on development and test solutions in a military lab or ready to deploy systems on land, air, sea, or space. 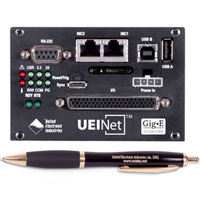 Each UEI chassis includes a CPU, real-time OS, Ethernet interface and slots allowing the installation of I/O boards. UEI's MIL Cube (DNA-MIL) and Rack (DNR-MIL) are both 100% COTS and can be easily configured as a stand-alone or embedded I/O controller, programmed and hardened for integration with high density, multifunction DAQ systems. Both are designed to meet MIL-STD-810 and MIL-STD-461 (including all power supply requirements) and are also perfect for test, measurement and control applications that require MIL-PRF-28800F Class 1, 2, 3 and 4 ratings. UEI systems are cybersecurity ready, providing hardware encryption and assured NVRAM protection options. All our boards are compatible with all of our chassis options. With more than 70 I/O boards available, we’re sure to have just what you need. 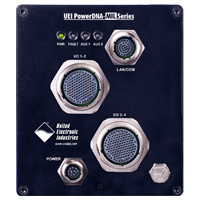 UEI's has a wide variety of I/O solutions that are designed to meet demanding requirements. We offer full avionics support, including MIL-STD-1553, ARINC 429/453/708/825, AFDX™, as well as analog and digital I/O, variable reluctance/speed inputs, RVDT/LVDT, synchro/resolver boards and even support for the Hellfire missile interface. UEI has a long history of providing successful solutions for many mission-critical applications. Whether it has been a compact 1553 analyzer solution (UEINet 1553 Cube), command and control computers for the LCAC, or smart flight-line munition testers for the Navy CAATS system, UEI has been relied upon for quality technology and first-class support. All of UEI's products are covered by our 3-5 year hardware warranty and our 10-year availability guarantee. UEI is here to support your applications for the long haul and we remove the worry of product life obsolescence by our driven dedication to being the industry leader in the marketplace.